The most effective things that you can do at home to decrease low back and neck pain is to do the back stretches and strengthening exercises that align your spine and level your pelvis. 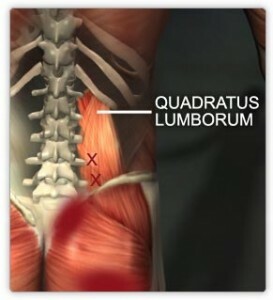 The muscle that pulls the left side of your spine and pelvis out of alignment and causes left sided back pain (and may radiate into your left leg) is the quadratus lumborum muscle. 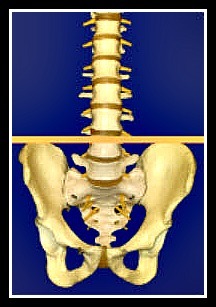 It attaches to your lowest rib, lumbar spine and top of your pelvis (iliac crest). In order to stretch it you need to stretch your left arm over your head and lean to the right, this stretch is demonstrated in the DVD, “The Missing Link to Neck and Back Pain Relief.” This stretch can help relieve left sided low back pain and sciatic pain in the left leg. The muscle that pulls the right side of your low back and pelvis out of alignment and causes right sided back pain (which may also refer into your right leg) is the right hip flexor, the iliopsoas muscle. It attaches to all of the lumbar vertebrae, lumbar discs and then runs forward to attach to the front on your hip bone (femur). 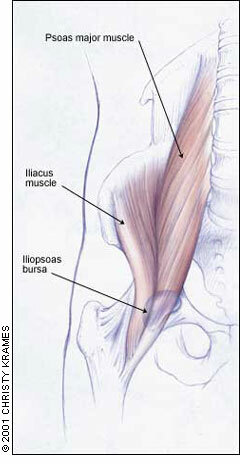 The iliopsoas muscle when tight and spasmed is very powerful for compressing your lumbar spine, pulling the right side of your pelvis out of alignment and contributing to herniated discs. It is commonly shortened in many of us because we tend to sit too much. This muscle is stretched with a lunge stretch by kneeling down, placing your left leg in front of you and leaning forward, keeping your shoulders up. This is a common yoga pose. This stretch is also demonstrated in the DVD,”The Missing Link to Neck and Back Pain Relief.” It can relieve right sided low back pain and sciatic or radiating pain into the right leg. When you have pain that is centered in the lumbar spine you probably need to do both of these stretches. Stretching the right quadratus lumborum muscle or the left iliopsoas muscle will not hurt you, but will not help to relieve your pain. One needs to stretch the left quadratus lumborum and the right iliopsoas muscle to relieve pain and align the spine and pelvis. Modalities like hot packs and cold packs will only treat your symptoms temporarily. If you are in the middle of herniating a disc (an acute disc disruption) a hot pack can actually hurt you, why is that? The nucleus pulposus is the jelly fluid that leaks out of your disc and herniates through the outside layer (the annulus fibrosis). The nucleus imbibes (attracts) fluid to itself so that under normal conditions the discs can hydrate and stay plump. However, when the disc is herniating and leaking through the outside layer of ligamentous tissue this imbibing action can cause the herniation to grow and increase the chances of nerve pain, etc. It is always safer to stick to cold packs. If you have pain that is radiating past the level of your buttocks, it is best to be evaluated by a professional to make sure you are not herniating a disc, as it may not be safe to do any back stretches at that time. You are very welcome, I hope to be able to help lots of people heal their bodies.